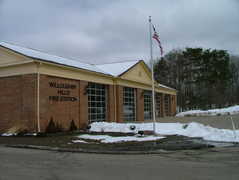 The Willoughby Hills Community Center houses several meeting rooms that are available for rental and a branch of the Willoughby-Eastlake Public library. 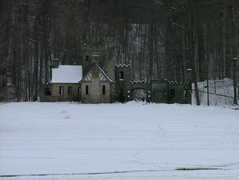 The building is situated adjacent to the Roemisch Fields municipal park. 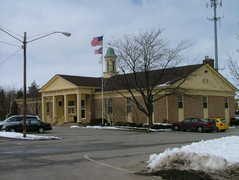 The Willoughby Hills City Hall is located in front of Campbell Park on Chardon Road. 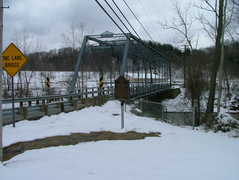 This bridge is an example of the Wrought Iron Bridge Company earlier design for a large span Whipple truss. It has been rehabilitated for continued vehicular use at the expense of historic integrity and alteration. Floorbeams, pins, and other elements are not original. Many rivets were replaced with high strength bolts. An interesting feature of the rehabilitation was that it was galvanized instead of painted. The silver/grey color created by galvanization is not offensive, and indeed its lighter color helps bring the truss bridge details out. The bridge is rare as an example of a Whipple truss, and also the last remaining highway truss in Lake County, Ohio. 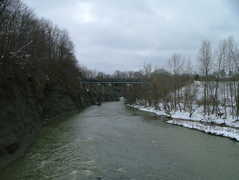 The Chagrin River snakes under U.S. Route 6 and the historic Pleasant Valley Road Bridge. Campbell Park is located directly behind the Willoughby Hills City Hall. It can be accessed from either Chardon Road (through the City Hall parking lot) or from Eddy Road, where there is a dedicated parking area. Roemisch Fields park is locaated directly behind the Willoughby Hills Community Center and is accessed via the Community Center Driveway opposite the Fire Station. Located 17 miles east of downtown Cleveland, Manakiki Golf Course is an elegant public course. The classic Donald Ross design offers a variety of challenges including doglegs, water hazards, up-and-down shots, back-to-back par 5s, short, long, tight, and open holes, and two canyon holes.